Eric joined Synergy Financial Group in September 2014. He graduated from Salisbury University with a degree in Finance and a concentration in Personal Financial Planning, which is registered with the CFP Board. 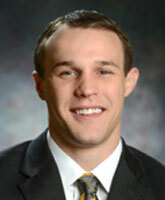 Eric attended John Carroll in Bel Air and played football at Salisbury University. Eric is a registered representative and holds his FINRA Series 7 through LPL Financial. He is also an investment advisor representative through Synergy Financial Group and carries his Series 66 registration through Synergy Financial Group and LPL Financial. Eric has gained valuable experience by working with advisors and clients. He has started preparation for the CFP® exam, as his college curriculum satisfies the education requirements of the Certified Financial Planner Board of Standards Inc.